Scientists have obtained high resolution satellite images that paint a stark picture of how tropical glaciers in the Pacific have retreated over the past decade. 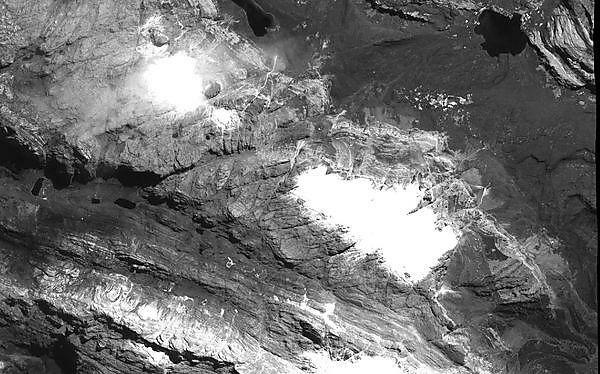 The images taken from the Pleaides satellites reveal that the formerly extensive Carstenz Glacier of West Papua has almost completely disappeared, while the once continuous East North Wall Firn has split into a number of much smaller fragments. The findings have been released by scientists at Plymouth University and the Britannia Royal Naval College Dartmouth (BRNC) and come on the heels of record-breaking temperatures around the globe. During the project, Dr Lavers and colleague Dr Victor Abbott, of the School of Biological and Marine Sciences, arranged for the Pleaides satellites to take the images in June 2015 as it passed West New Guinea. These were then compared to similar pictures taken between 2000—2002 and obtained from the Digital Globe Foundation. The pictures reveal the almost complete disappearance of the Carstenz Glacier – first discovered by explorer Jan Carstenz in 1623. And the extensive East North Wall Firn has retreated from the 1,333,000 m2 continuous area into a number of smaller fragments, the largest of which is 313,334 m2. This form of remote sensing is useful for areas considered too dangerous or difficult to visit – as has been the case in West Papua. The report will be published in the Remote Sensing and Photogrammetry Society quarterly publication Sensed.